A farm site along Minnesota State Highway 60 near St. John’s United Church of Christ, Wheeling Township, rural Faribault. 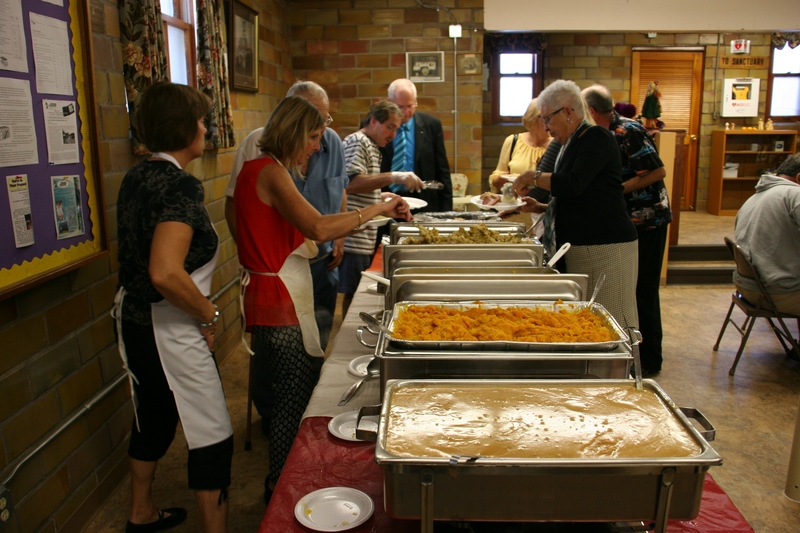 IN A RURAL SETTING not far from Nerstrand Big Woods State Park, the members, families and friends of St. John’s United Church of Christ, Wheeling Township, serve not only an incredible German dinner each September, but also incredible hospitality. Shirley checks and refills food on the serving line. Even the pickles are homemade. Through my many years of attending dinners, luncheons and other events at this country church, I’ve gotten to know these friendly folks—Lynn, Kim, Doug, Craig, Shirley… I can’t come and go without stopping to greet and hug sweet Elsie, who now into her nineties still works in the kitchen stirring gravy or potato salad or cutting and plating pies (during the church ice cream socials). Truly, these dinners are labors of love. Here two volunteers, in ethnic costumes, take a break at the root beer stand. Petting zoo animals come from a nearby farm. There’s always a well put together historical display. I can only imagine the tremendous time, effort and energy involved in pulling off Germanfest, an event which features more than just the showcased ethnic meal which this year fed some 650. I appreciate the country store and market that offer home-baked and garden grown goods and more. I appreciate, too, the quilts stitched by talented hands and the music and petting zoo and historical displays and more. On the church altar, a beautiful harvest display. There’s something divinely wonderful about a Minnesota church festival that reconnects me to the land, that brings a sense of peace in a world brimming with too much discontent and chaos. This gentleman arrived from four miles away in his Model T Ford. Congregants make and sell crab apple jelly from trees growing on church property. Dressed in lederhosen, a volunteer pauses to enjoy the music and check out the market under the tent. Lucy, seven months, and her grandpa listen to the old-time music. I observed these guys kicked back and relaxing to the music of the Ray Sands Band. A display of German items honors the congregation’s heritage. I enjoyed this over-sized woodcarving of a fisherman. Church festivals are made for visiting. Ice cream cones of feed for animals in the petting zoo were popular with the kids. These piglets were among animals in the petting zoo. Even the church windowsills are adorned with harvest themed decor. One final look at St. John’s UCC as we drive away. NOTE: To all my readers who wish I would have told you about this church dinner in advance, I’m sorry. Please mark your 2018 calendars for next September. Germanfest is always held around the same time annually. But I can tell you about another outstanding area church dinner set for 11 a.m. – 1 p.m. this Sunday, October 8, at Trinity Lutheran Church, North Morristown. 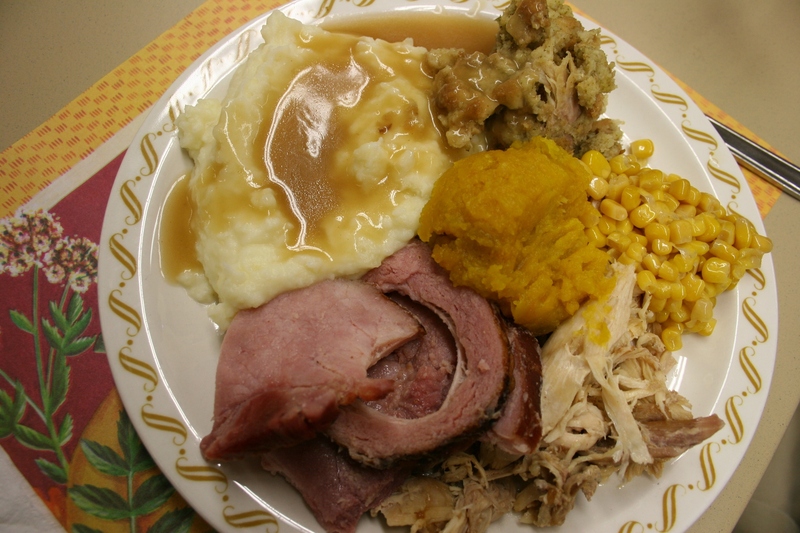 With a homemade meal of turkey, ham and all the fixings, it’s one of the best (in my opinion) church dinners around. The event also includes a craft and bake sale in the church basement. Click here to read previous posts about Trinity’s fall dinner. Please check back for one last post in my four-part series from Germanfest. You won’t want to miss this final, especially endearing, photo essay. Click here to read my first post and click here to read my second post, both published last week. THE OCCASIONAL LUMP in mashed potatoes is culinarily acceptable to me, because it means the potatoes are real. Not instant. 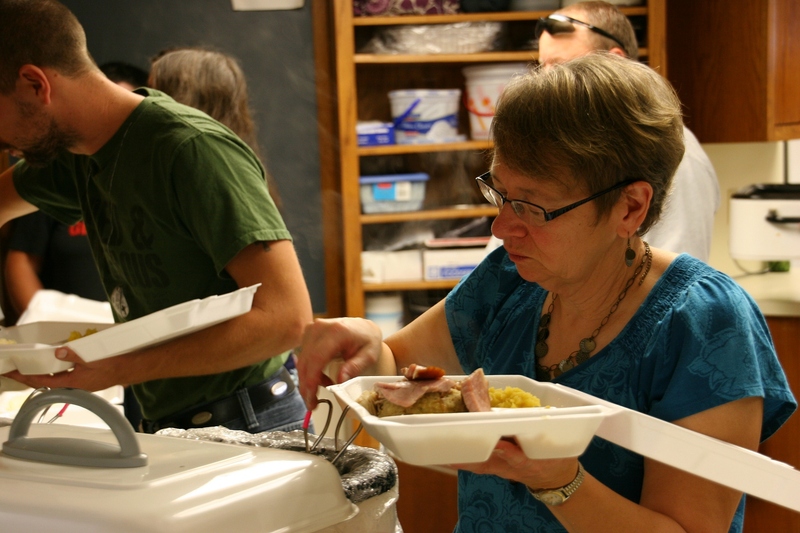 Delicious home-cooked food fills roasters at Trinity’s annual fall harvest dinner on Sunday. That’s gravy in the first roaster and squash in the second. When you dine at the annual fall harvest dinner at Trinity Lutheran Church North Morristown, as I did on Sunday, you get (mostly) authentic homemade food. Potatoes that have been peeled and mashed in the church basement. Sometimes with lumps. Baked turkey and ham sliced into roasters. Squash picked from the garden and baked. Cranberries that are prepared, not dumped from a can. Volunteers sell tickets outside the church. 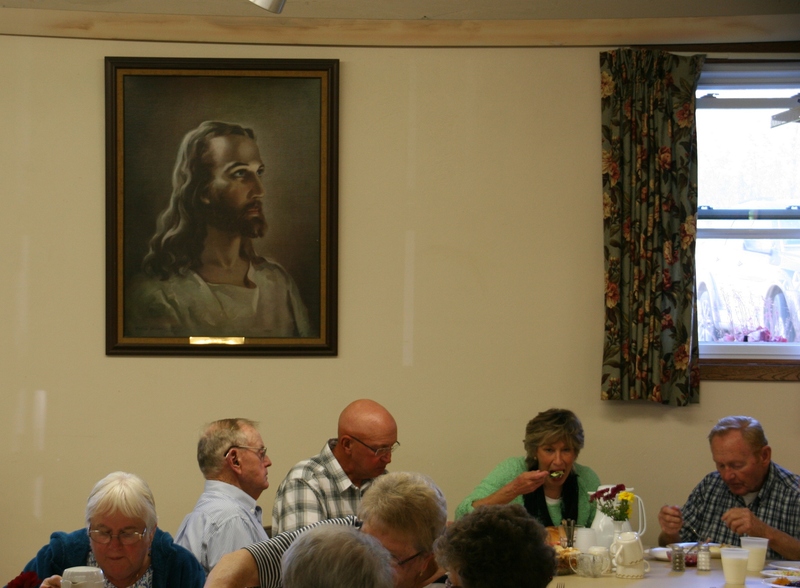 As much as I savor the delicious food served at this church dinner, I also delight in the location and the people. 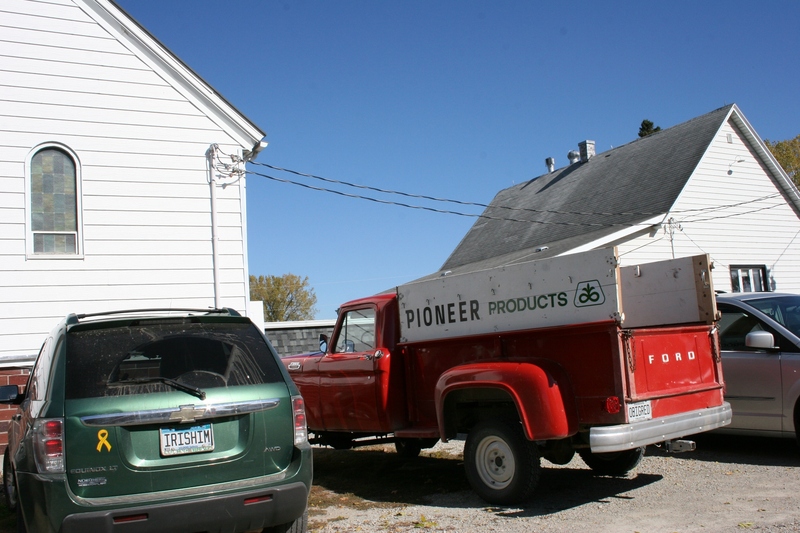 To drive into the country on an October Sunday to celebrate the harvest among hard-working folks rooted in the land seems a rural pilgrimage. 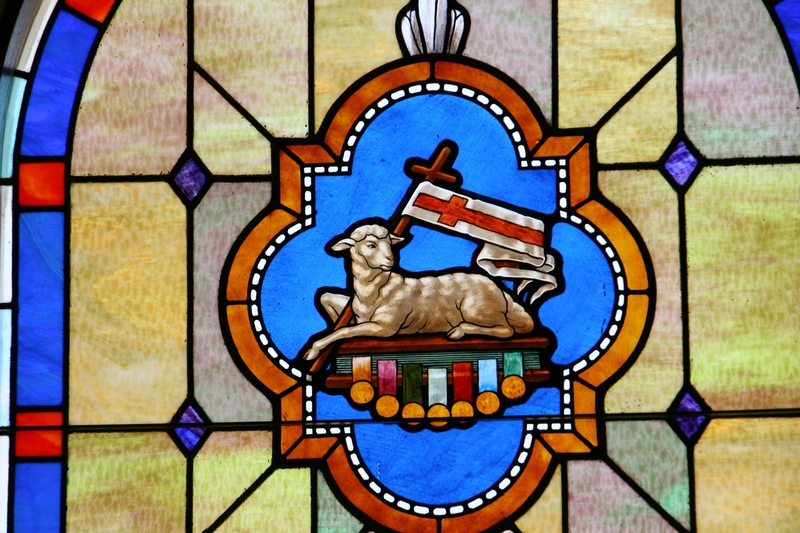 A snippet of the stained glass window in the balcony. Diners file into the sanctuary through a side door and wait in pews until dining space opens in the basement. Stunning stained glass windows line the sides of the sanctuary. 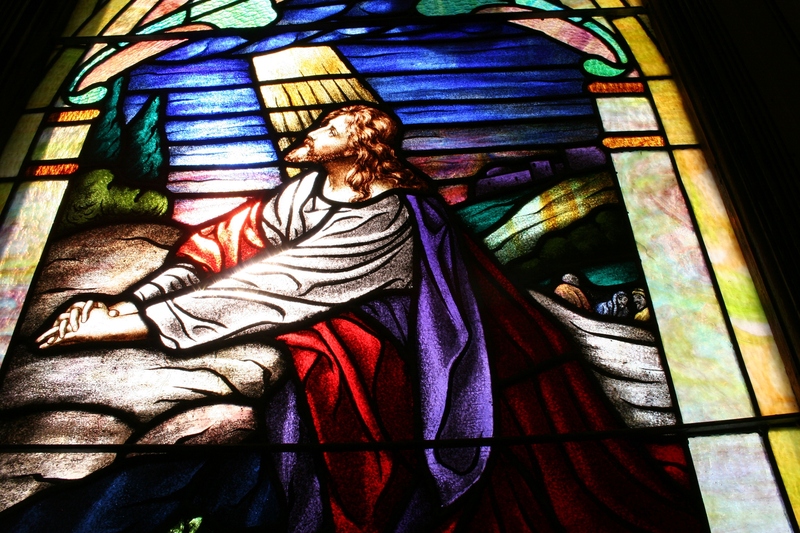 To wait in the pews of an aged church, stained glass windows filtering light, seems almost sacred. Members of the kitchen crew dish up meals for take-out. In the fellowship of church diners, there’s a reverent respect for those who labor in the church basement. For they provide that which fills the stomach as much as the soul with all that is good. Food and fellowship. 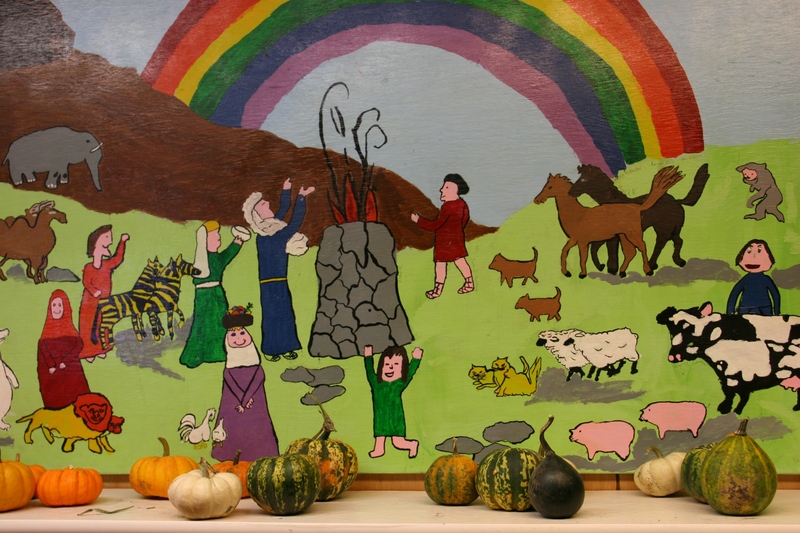 Decorations celebrate a thankfulness to God for the harvest. Whether you come with family or friends or no one, you’ll soon be engaged in conversation. Two lines keep things moving. 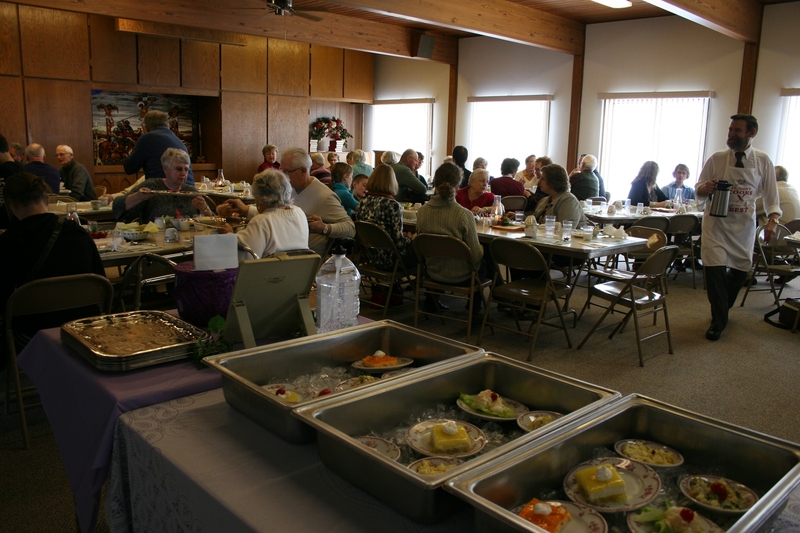 About 430 diners attended Sunday’s dinner. Dining in the church basement. There’s something simply satisfying about sitting on a folding chair in the closeness of a church basement communing with others at a Thanksgiving style meal. Conversation and pass the coleslaw please. Or the cranberries. Clatter of knives and forks and a swarm of volunteers squeezing between tables to pour coffee and deliver plates of frosted cakes and then, afterward, to clear plates and set new place settings. The pastor and his family raise chickens in a backyard coop. North Morristown is authentically, next to cornfields and farm sites, rural. 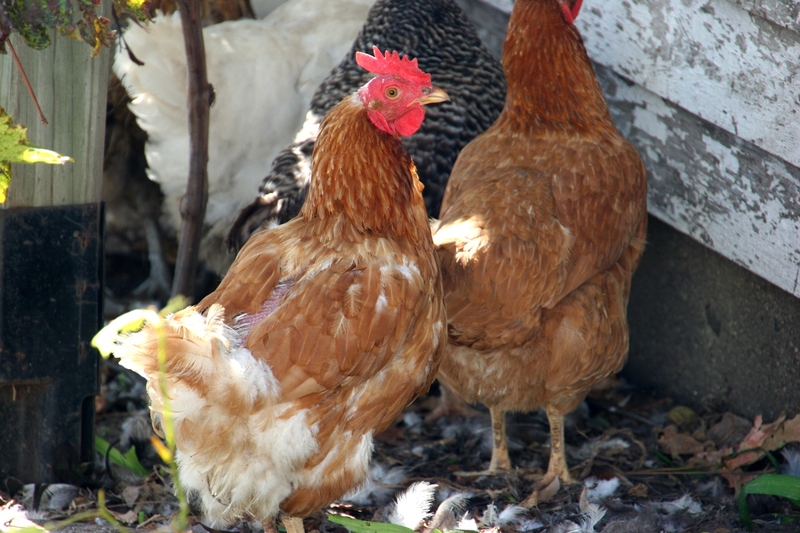 It’s as rural as chickens in the pastor’s backyard. Sven the dog plays catch me. It’s as rural as Sven the dog roaming the church grounds. Just down the road from Trinity, harvest is underway at this farm. 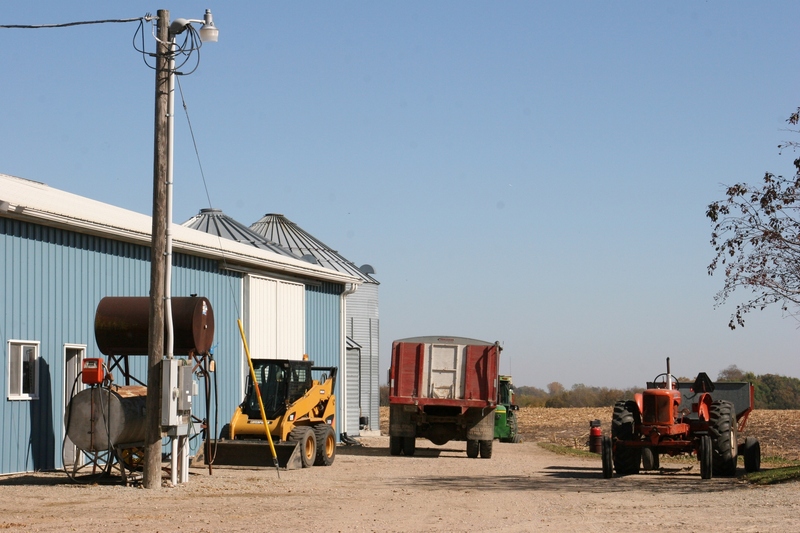 It’s as rural as a grain truck and a wagon brimming with soybeans a farm site away. 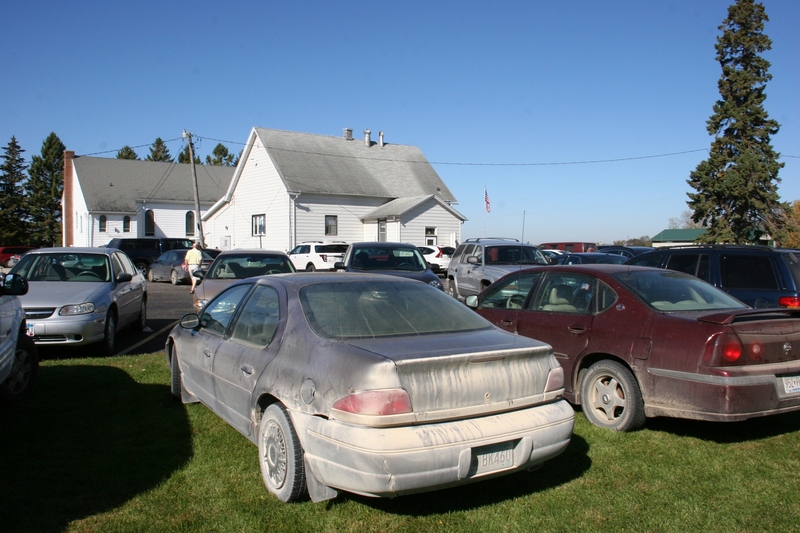 Vehicles ring the church and school during Sunday’s dinner. No pretentiousness exists here. Even the pastor excuses himself to wash dishes in the church basement. 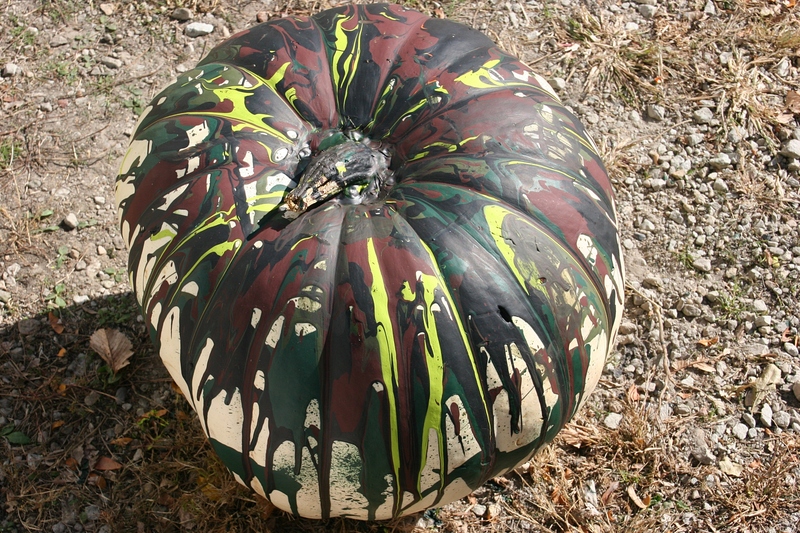 Gigantic painted pumpkins sit outside the church and school. 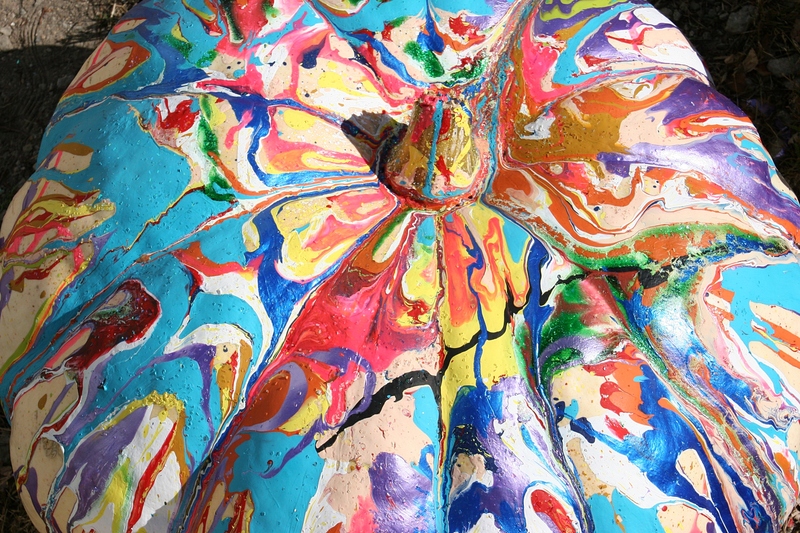 Kids at the school painted pumpkins as part of art class. Produce, baked and canned goods, crafts and more are sold in a back room of the church basement. 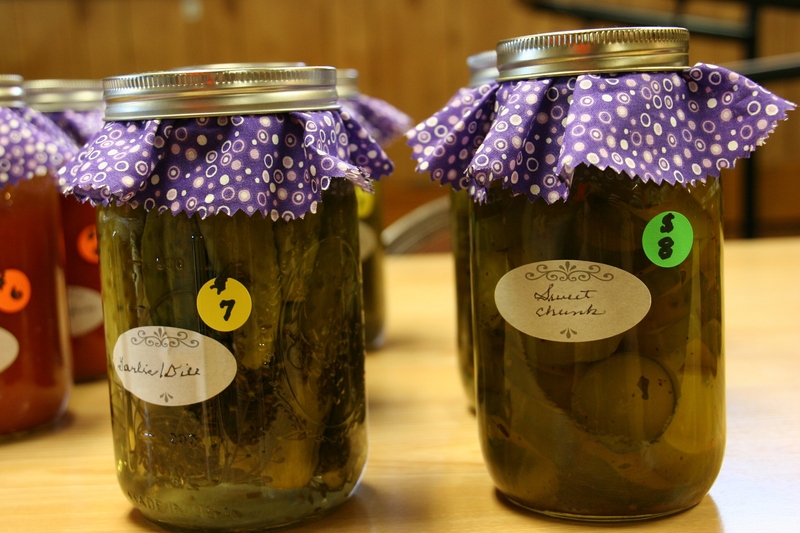 Church members bring in canned produce to sell, like these pickles. Several years ago I photographed this lovely woman drying dishes. She worked for years at the dinner, but is no longer able to do so. I found her resting at the craft and bake sale. 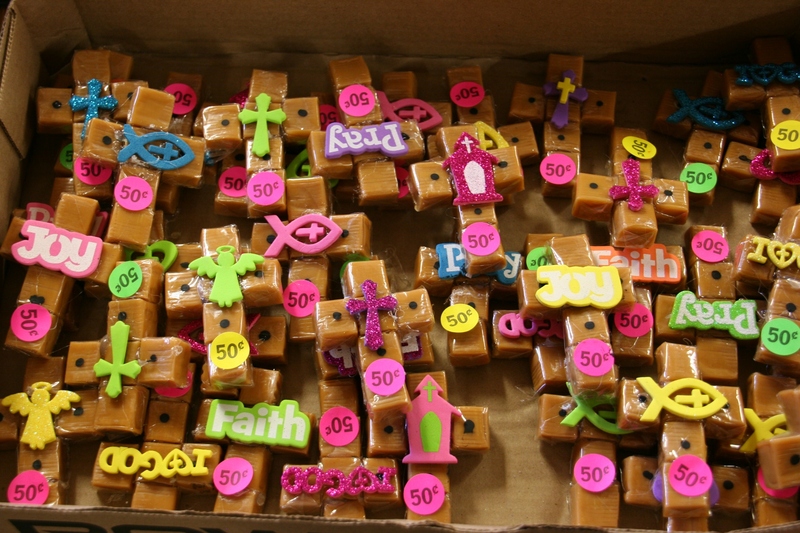 My friend Tammy, a native of North Morristown, crafted these caramel crosses and other items for the craft sale. My meal at a previous Trinity North Morristown dinner, minus the bread and cranberries. I had cake for dessert, too. Minnesota Prairie Roots file photo. IT IS THE SEASON of church dinners in Minnesota, which is why I’ve deviated today from the usual Minnesota Faces series to Minnesota Food. 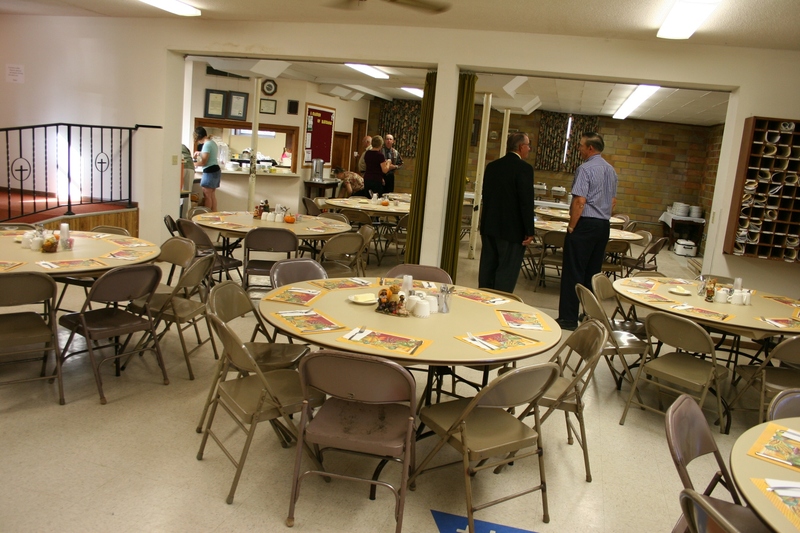 This Sunday, October 11, Trinity Lutheran Church North Morristown, a rural parish in western Rice County, hosts its annual fall harvest dinner. I’ve been to many church dinners and this one ranks as my favorite. Everything served here is homemade from the garden-grown potatoes and squash prepared in the church basement to the dressing, bread and more, all served with turkey and ham. It’s a feast. And one served in good company by rural folks who welcome and engage you in friendly conversation. Go for the people, experience and setting as much as the food. Serving begins at 11 a.m., shortly after the 9:30 a.m. worship service, which I’d also encourage you to attend. There’s something about worshiping in a small country church surrounded by farm fields that focuses thoughts on thankfulness for the harvest and all the blessings of life. Besides the dinner, which runs until 1 p.m., Trinity also hosts a bake goods, produce and craft sale in the back room of the church basement. More goodies from gardens and kitchens plus handcrafted items. Cost for the dinner is a reasonable $10 for ages 13 and older; $5 for ages 6 – 12; and free for ages 5 and younger. You will leave feeling stuffed and blessed. FYI: Dinner planners are looking for people to peel potatoes beginning at 8 a.m. Saturday. TELL ME, DO YOU FREQUENT church dinners and do you have a favorite? Parked outside Trinity Lutheran Church North Morristown on Sunday morning for the congregation’s annual fall dinner. THE IRISH I M van parked outside the German Lutheran Church makes me laugh. And it’s good to laugh on a Sunday morning when the power has been out for hours and the Lutheran ladies have been scurrying, along with their anxious husbands, to cart roasters of hot food from the church basement. It is the morning of Trinity North Morristown’s annual fall dinner and the worst possible date for the power to fail at a nearby substation. Before worship services on a Sunday morning at Trinity Lutheran Church, North Morristown. Minnesota Prairie Roots file photo. 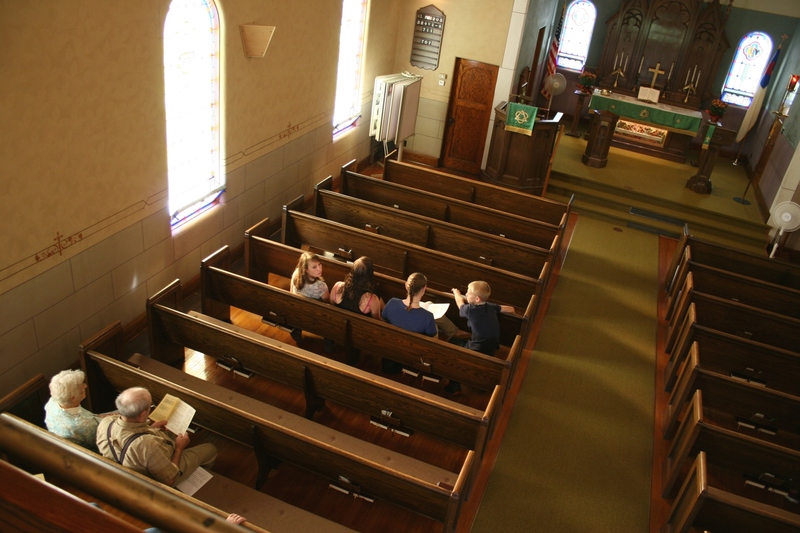 Upstairs in the sanctuary, pews are nearly empty as congregants scramble to move food to the homes of parishioners with power and to nearby Camp Omega. Eventually the pews fill. The church organist gathers her songbooks from the balcony and hurries to the piano at the front of the sanctuary. The pastor jokes, during the morning worship service, about his strong and resilient German Lutheran congregation, then prays later for the electricity to come back on. But when he blesses worshipers, the lights are still out. So the well isn’t working and the toilet can’t be flushed except it can with water hauled in milk cans to pour into the toilet tank. Outside, the scent of coffee wafts from an open kettle set atop a propane fueled burner. 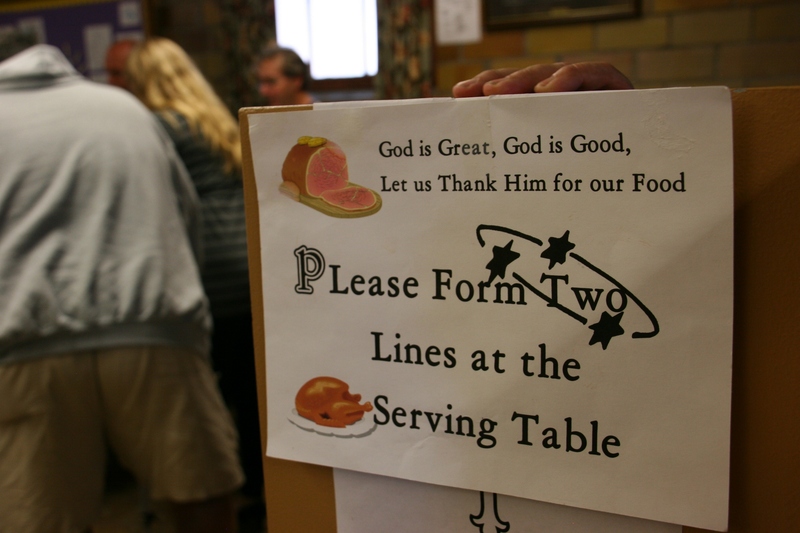 Tickets for the dinner are selling and diners file in a side door, up the steps and into pews to await dismissal to the basement. Food has been hauled back, down the stairs, into the semi dark kitchen. 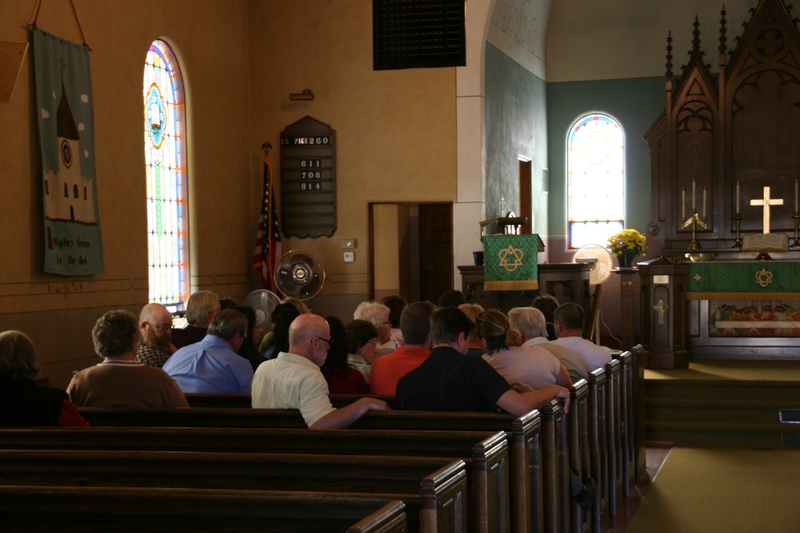 In the dim light of the sanctuary, conversation flows with the comfort that comes from visiting within the close confines of a small country church. Then, just like that, the lights flick on at 11:10 a.m. Applause erupts. An audible gasp escapes, though, when the power flickers, off and on, before remaining on. Tables await diners in the church basement. Minnesota Prairie Roots file photo. 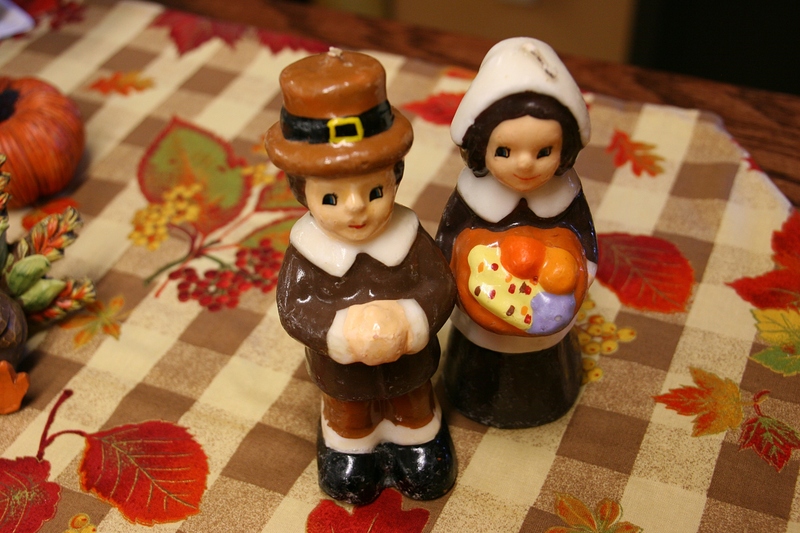 Diners file to the basement, the IRISH I M and the Lutherans, to feast on ham and turkey and to give thanks for an answer to prayer. 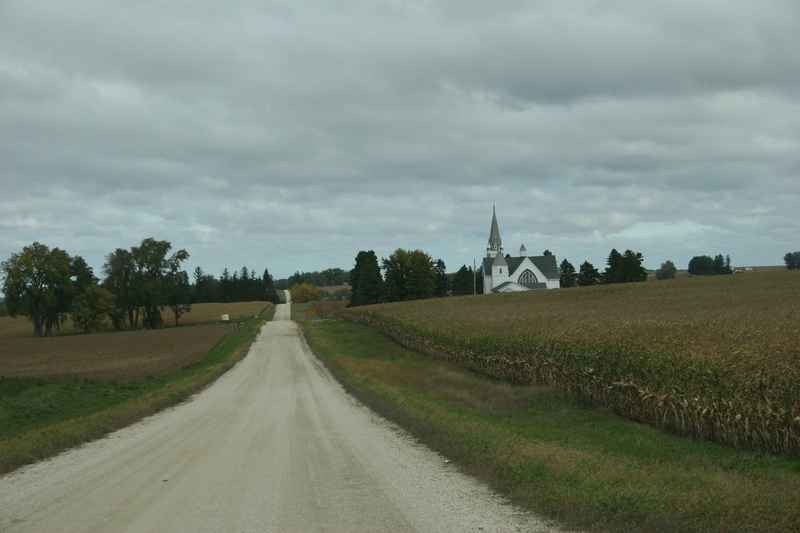 Vang Lutheran is set among the farm fields of Goodhue County. The name “Vang” means field. Vang is a region of Norway from which the area’s first settlers arrived. 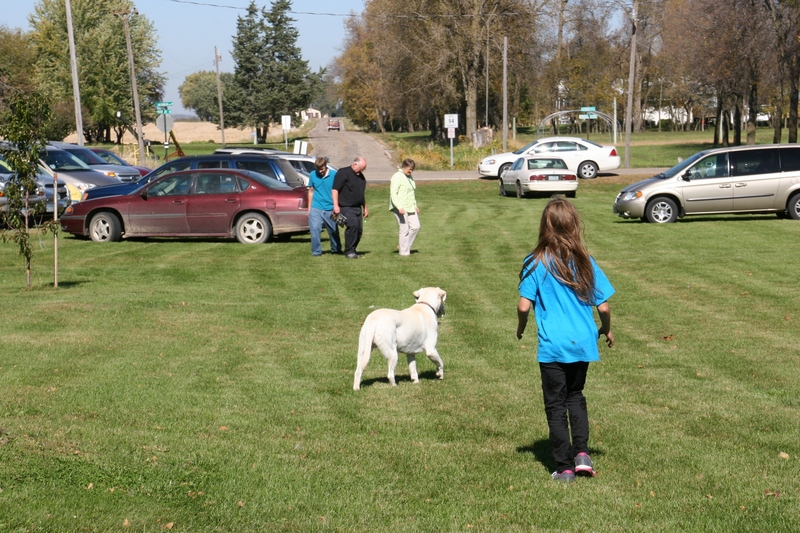 JUST DAYS BEFORE THE 34th annual Lutefisk and Norwegian Meatball Supper at Vang Lutheran Church, rural Dennison, the ladies were busy prepping Saturday morning. 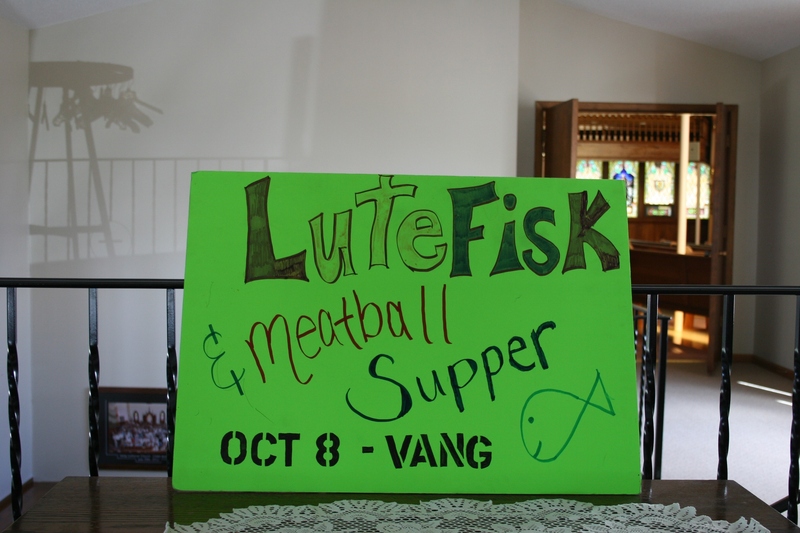 A sign inside Vang Lutheran Church advertises its annual Lutefisk & Meatball Supper. 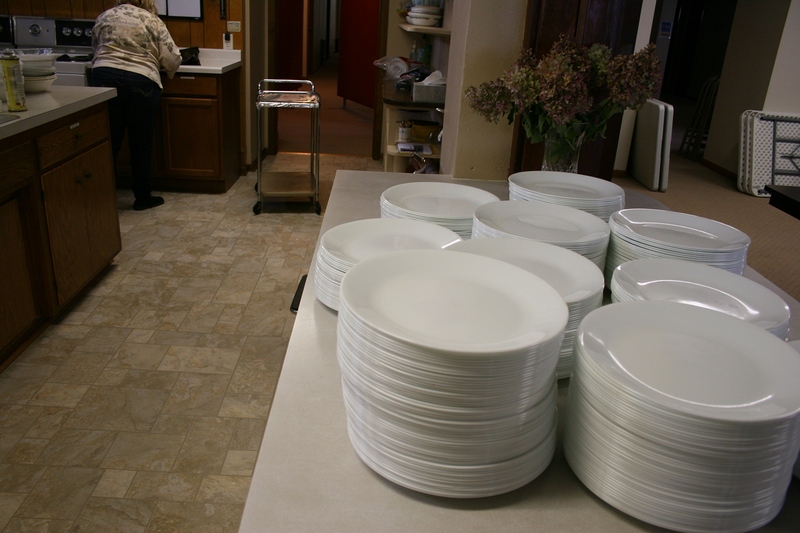 Plates are stacked on the kitchen counter awaiting diners. Lists have been made with assigned jobs. Church ladies bring bowls from home. 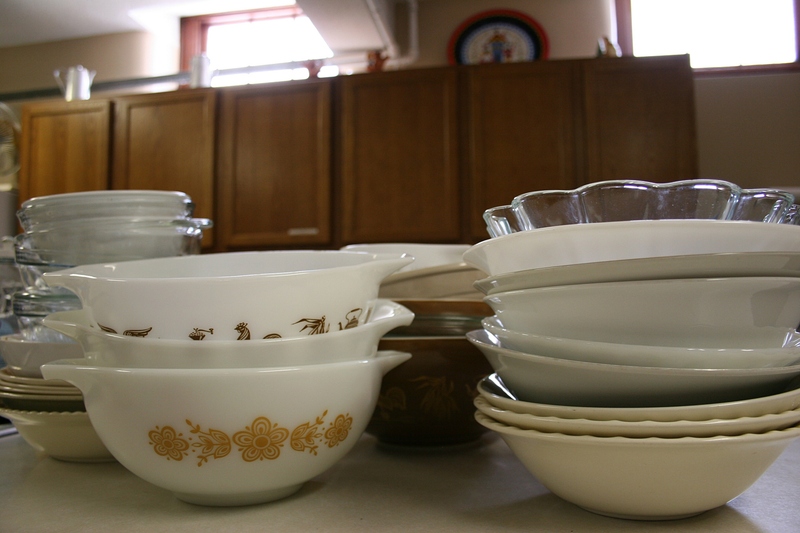 Dishes and bowls stacked. Counters covered in plastic. Floors scrubbed. Lists in place. Folding chairs ready to unfold. Beet preserves and pickles already in the country store, made with produce from the Vang-Dennison Lutheran Church parishes’ Growing Connections Garden. Vinegar stashed in the fridge for coleslaw. 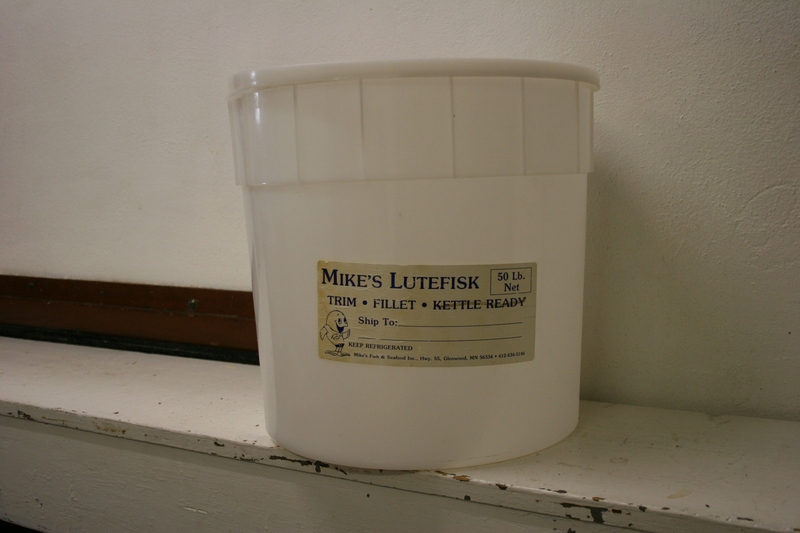 An empty lutefisk bucket from a previous supper. The lutefisk hadn’t arrived yet from Mike’s Lutefisk in Glenwood, Minnesota. 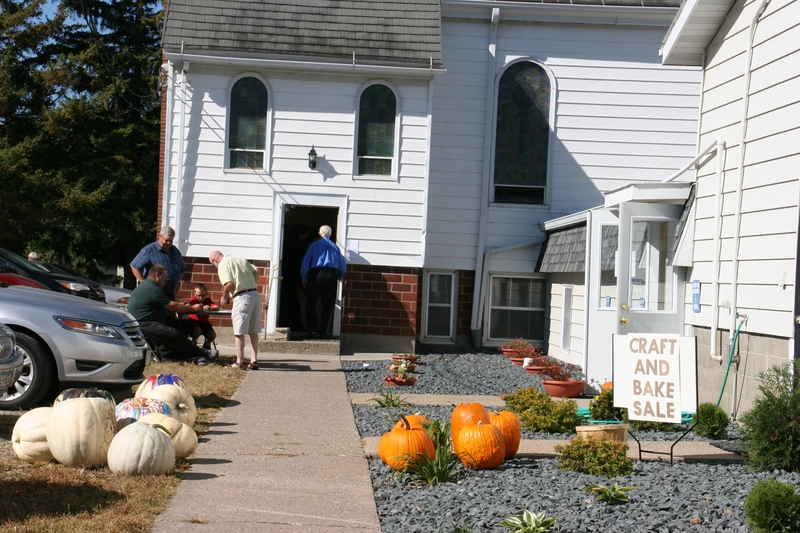 But this Norwegian Lutheran church is ready for the 1,150 pounds that will feed 1,200 diners on Wednesday, October 8. 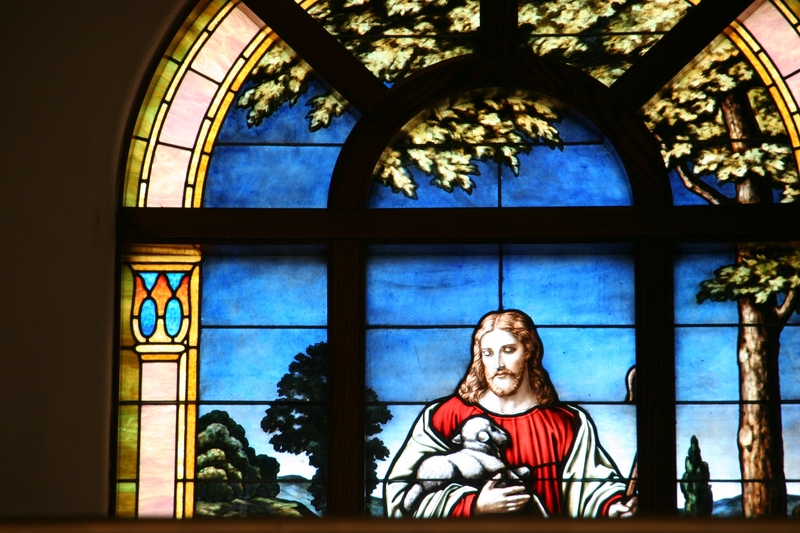 Beautiful stained glass windows grace the sanctuary. Not quite the 5,000 Jesus fed, but a seeming miracle for this congregation of 300 members—with a weekly attendance of 70 – 90—to prepare and serve this ethnic feast. 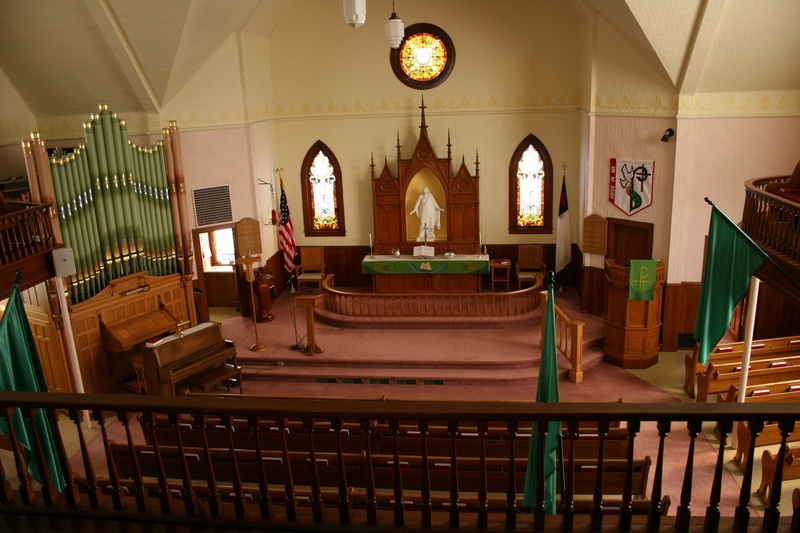 A view of the sanctuary from the balcony. 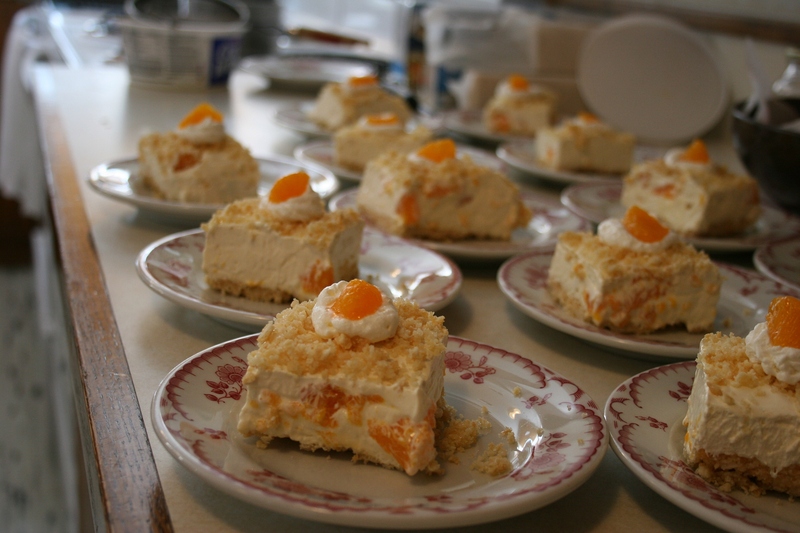 On the menu are lutefisk, Norwegian meatballs and gravy, mashed potatoes, corn, cranberries, coleslaw, rolls, fruit soup, lefse, Norwegian bakings and beverages. 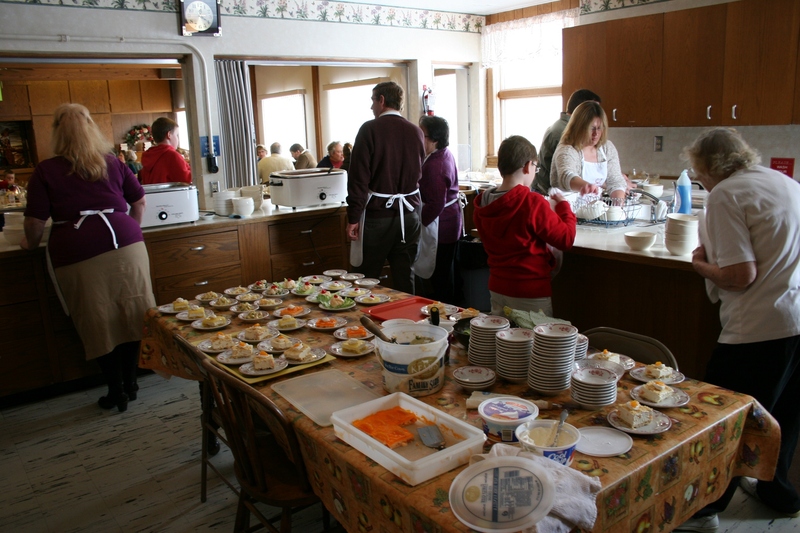 To feed that many requires 1,150 pounds of lutefisk, 550 pounds of meatballs, 200 pounds of butter (presumably for all that lutefisk), 600 pounds of potatoes, 36 gallons of corn, 110 pounds of coleslaw, 20 gallons of cranberry sauce, 20 gallons of fruit soup, 4,500 cups of coffee (Norwegians must drink a lot of coffee), 600 half-pints of milk, 2,600 pieces of lefse, 90 dozen buns and 2,600 Norwegian bakings. 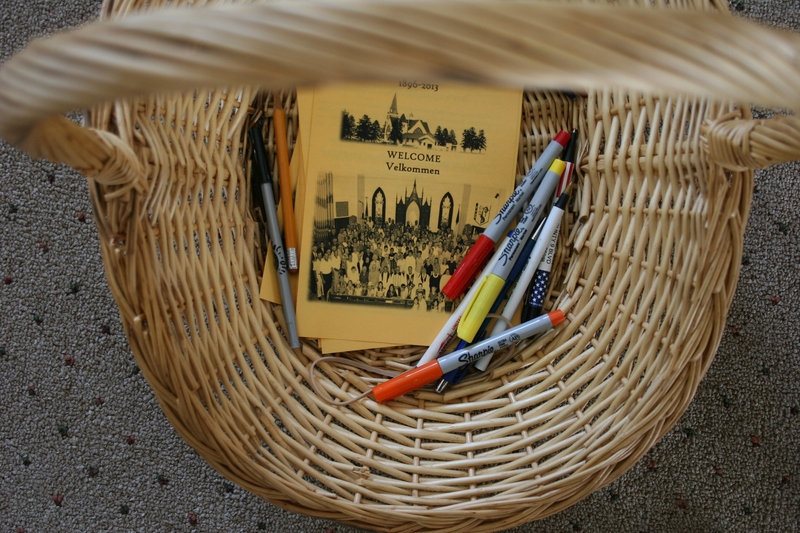 Diners will receive info about Vang and its annual supper like these informational sheets photographed in a basket. Mid-day servings are at 11 a.m., noon and 1 p.m. by reservation only. Call the church office at 507-645-6042. Continuous evening serving runs from 4 – 7:30 p.m. Cost is $16 for adults; $6 for 10 and under; and free for preschoolers. 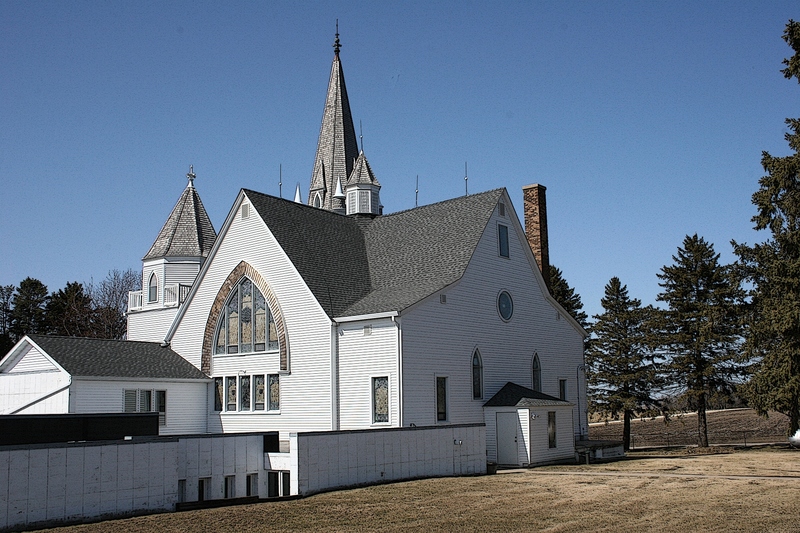 The picturesque Vang Lutheran Church was built in 1896. 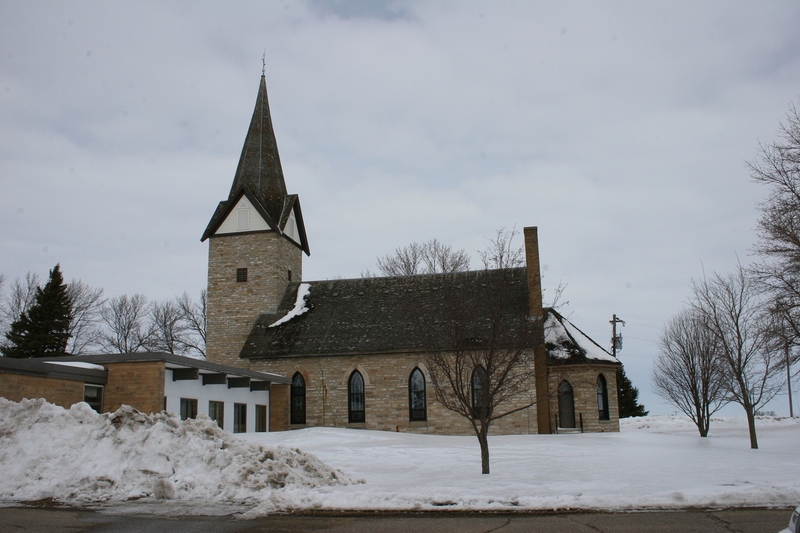 Vang Lutheran Church, 2060 County Road 49, is located at the corner of Goodhue County Road 49 and 20th Avenue, which is southeast of Dennison or seven miles northwest of Kenyon. I won’t be there. 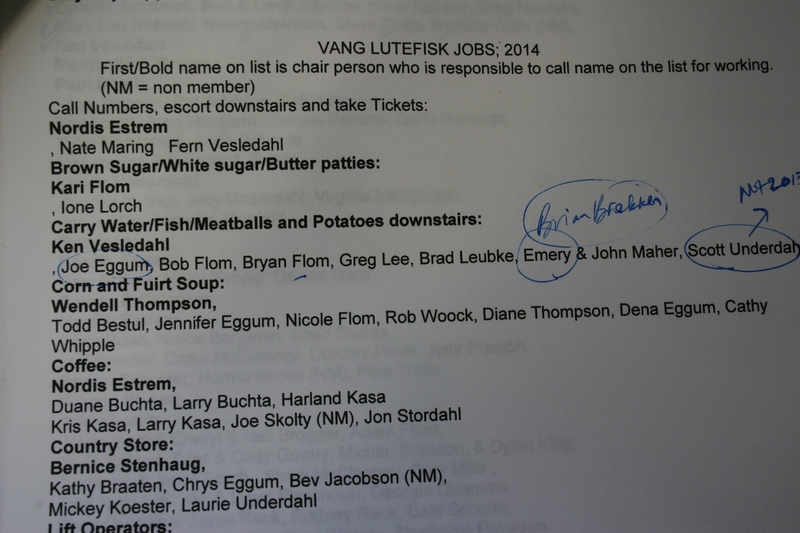 I don’t like lutefisk. But apparently plenty of people do. IT’S NOT TOO EARLY to start thinking lutefisk and meatballs. That is if you eat lutefisk, a Norwegian delicacy of cooked cod that has been soaked in lye. I know. Sounds awful, doesn’t it? I’ve eaten it twice, once when covering a church basement lutefisk dinner as a young newspaper reporter. The second time I sampled this fish out of respect for my Norwegian aunt whose maiden name is Knudson. I didn’t like lutefisk either time. Tastes like warm Jell-O. Smothering it with lots of melted butter does help. A bit. Whether or not I like lutefisk or meatballs matters not, though, because I’m German, not Norwegian. I don’t have to eat the stuff. Vang Lutheran Church. Minnesota Prairie Roots file photo. 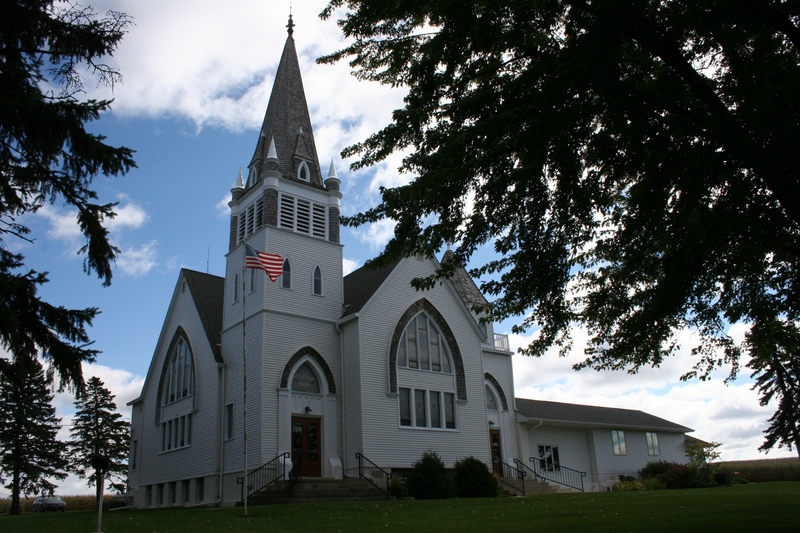 But for those of you who appreciate lutefisk, mark your calendars for the Wednesday, October 8, annual Vang Lutheran Church Lutefisk and Norwegian Meatball Supper. Vang is located 10 minutes north of Kenyon or east of Nerstrand with a County 49 Boulevard address. That’s in Minnesota, where, of course, many Scandinavians live. 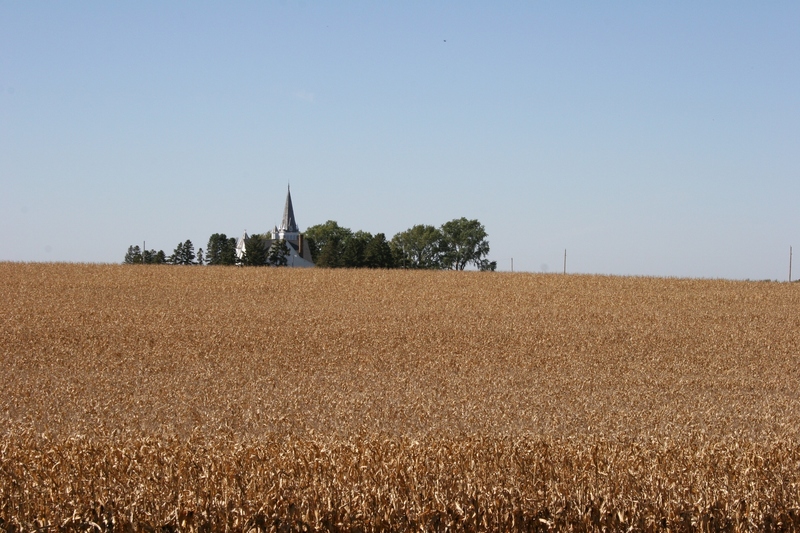 Vang Lutheran Church sits among the farm fields of southeastern Minnesota, near Kenyon and Nerstrand. Minnesota Prairie Roots file photo. I spotted this sign at a garage sale in Kenyon. 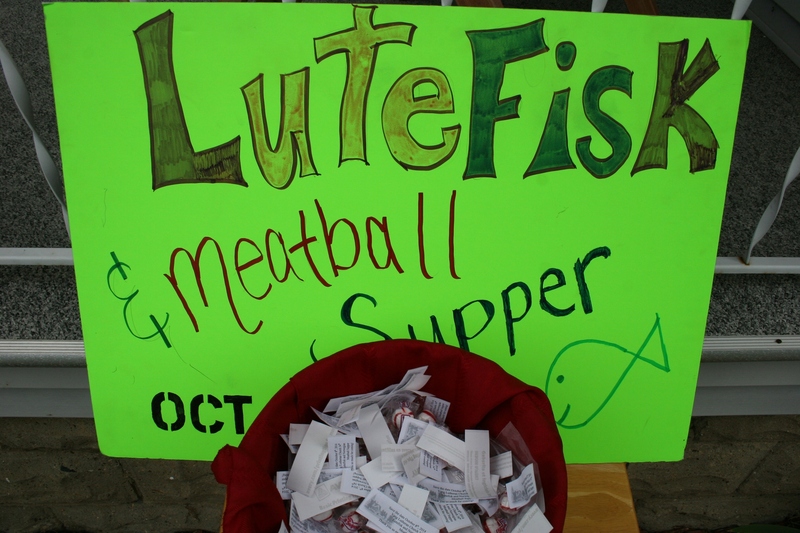 Have you eaten lutefisk? What’s your review of this Norwegian culinary specialty? 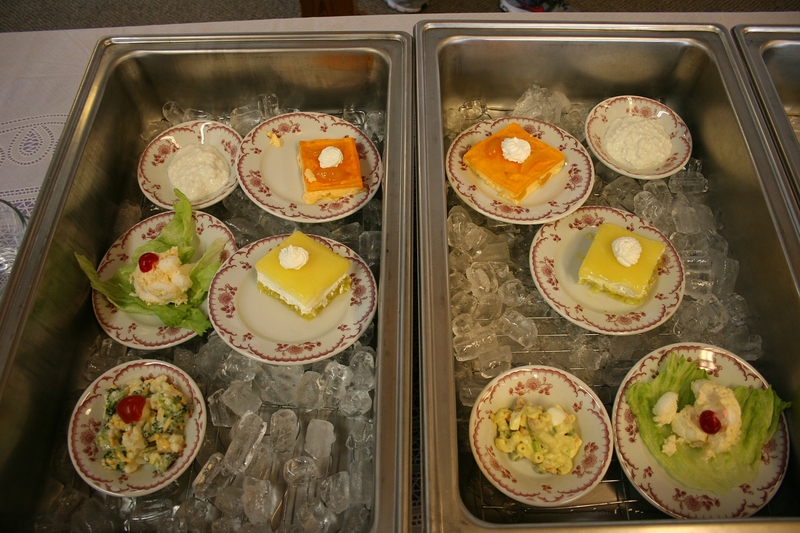 CLICK HERE TO READ a blog post about Vang’s lutefisk dinner written several years ago by a master of divinity student. SUNLIGHT FILTERS through the fellowship hall windows on an early Sunday afternoon in March. Outside the 40-degree temps feel balmy after a brutally cold and snowy Minnesota winter. St. John’s United Church of Christ, Wheeling Township, rural Faribault, Minnesota. I’ve left my coat in the van, drawing my sweater tight around me as I pause to photograph St. John’s United Church of Christ, Wheeling Township, before hurrying inside. The strong wind has a bite to it. Inside, I grab a shiny silver tray, select a salad from choices on ice, pinch lettuce into a bowl and add toppings before placing the tray on a table to photograph the salad selections. While I do so, a teen ladles a generous scoop of Ranch dressing atop my lettuce salad. Lynn, right, tends the potato soup in this duo scene, divided by a wall, of kitchen and fellowship hall. 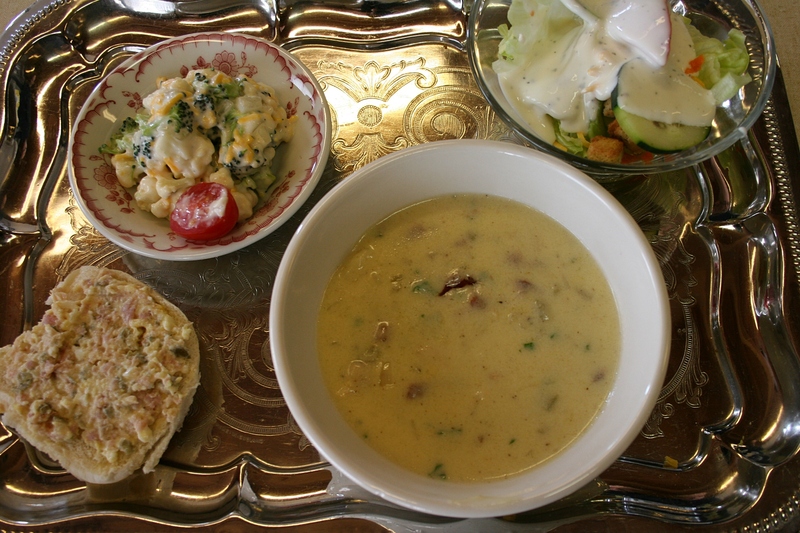 Next, I move toward the kitchen serving window to consider the soup offerings—chicken noodle, potato bacon and bean. All homemade. I start with potato. Lynn fills my bowl. Kim and Keith serve diners. Juggling camera and tray, I move down the line to the sandwiches. 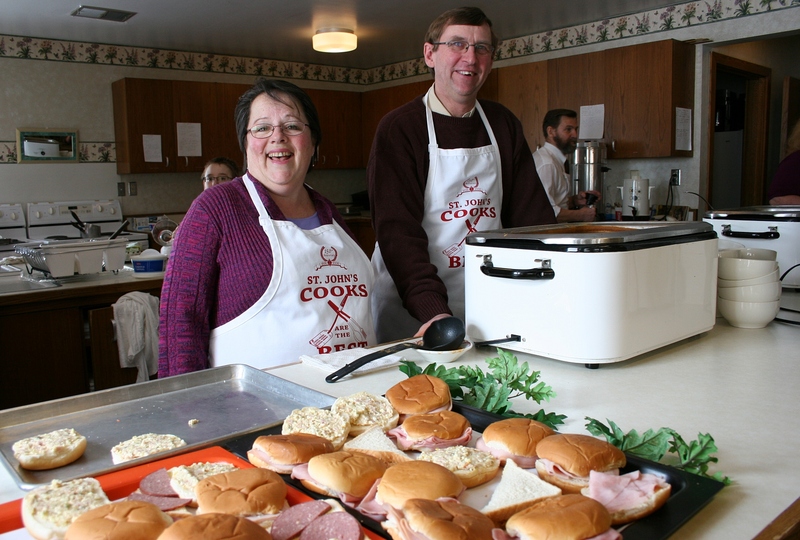 Kim and Keith are ladling soup, too, and refilling the sandwich tray. 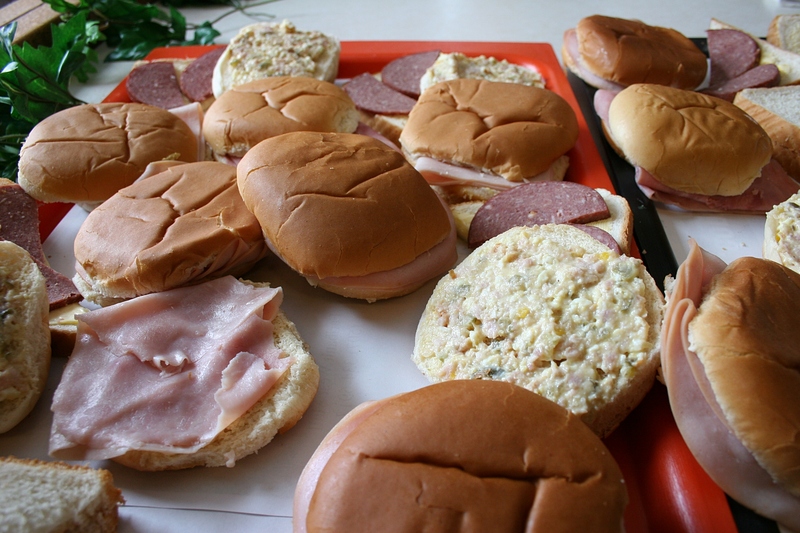 Sandwich choices from ham to sausage to open face. I choose an open face sandwich topped with a mix of meat and chopped pickles. My husband and I settle onto folding chairs at a table nearest the kitchen. 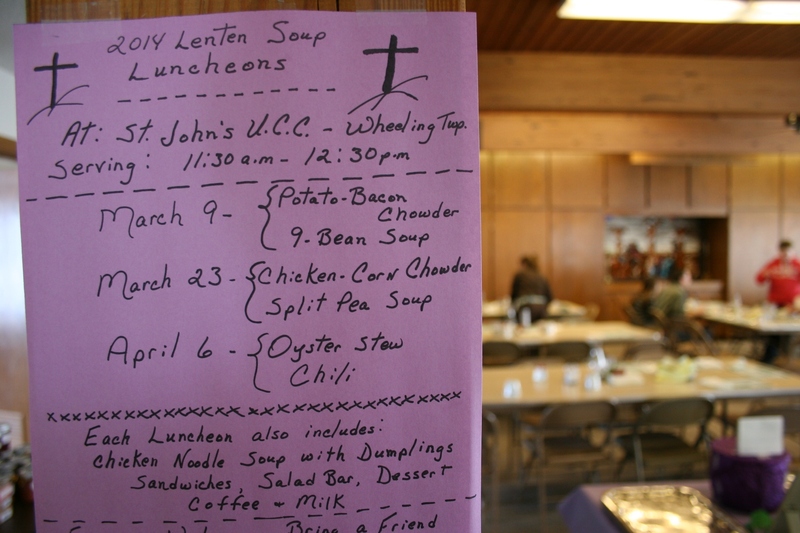 I want easy access to photograph the scene, the moments that define this first of three Sunday Lenten soup luncheons at St. John’s. I’ve been here before, often enough that parishioners welcome me into this country church east of Faribault just off Minnesota State Highway 60 along Jacobs Avenue. My first tray of food. I know the routine, too. Gather my food and then transfer bowls and sandwich onto a paper placemat so the trays are ready for the next diners. Key food preparer, organizer, church organist and co-youth leader, Craig, carrying a coffee pot, right, says 60 -70 diners were served at Sunday’s luncheon. There’s something about familiarity and dining in the company of the faithful, the din of conversation and the clack of kitchen noises, that comforts as much as a hearty homemade soup. Mandarin orange dessert plated for delivery to diners. For two evenings and a day prior, Craig and his mother, 88-year-old Elsie, and their neighbor, Lynn, have labored, preparing the three soups, the nine salads and the mandarin orange dessert. Parents of Youth Fellowship members brought the sandwiches. Brandon dries dishes. 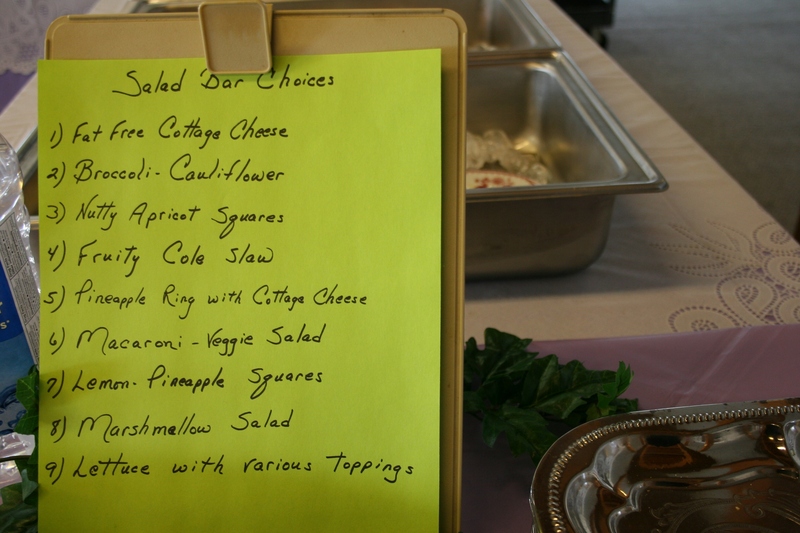 The Youth Fellowship sponsors the soup and salad luncheons. 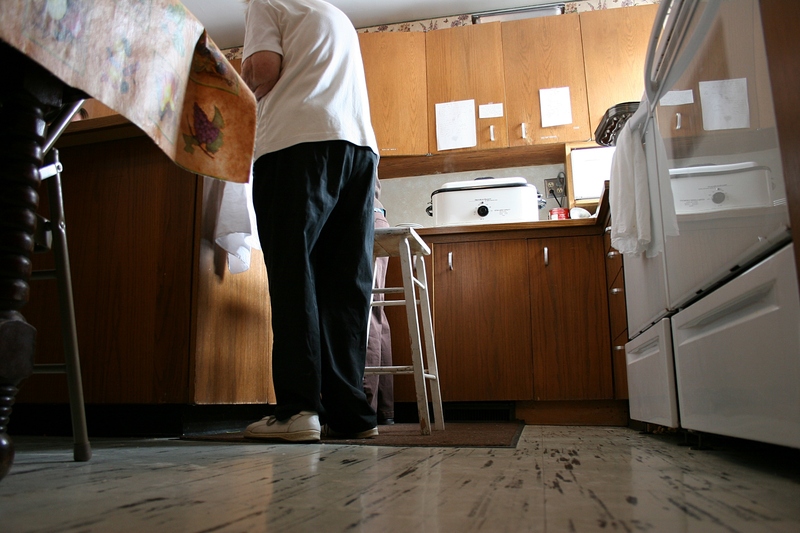 In the kitchen, 13-year-old Brandon dries dishes beside his mother and Elsie. Others tend the soup, sandwiches, salad and dessert. Youth hustle to bring and refill beverages, to clear tables, to deliver dessert. Craig rushes to refill coffee pots and cups. 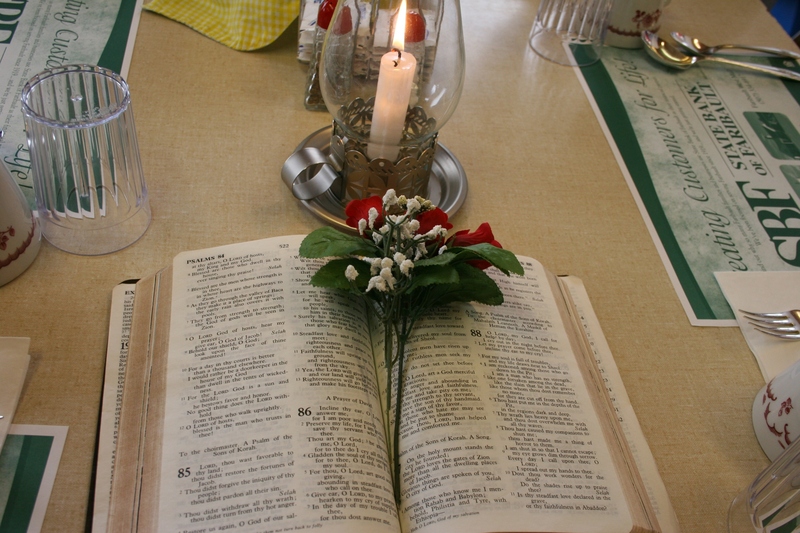 Bibles, florals and candles decorate tables. I observe it all, from tabletop bible centerpieces opened to Psalms to the dainty floral pattern on church china to the stool I’ve seen Elsie use in the kitchen every time I’ve been here. She’s always in the kitchen. 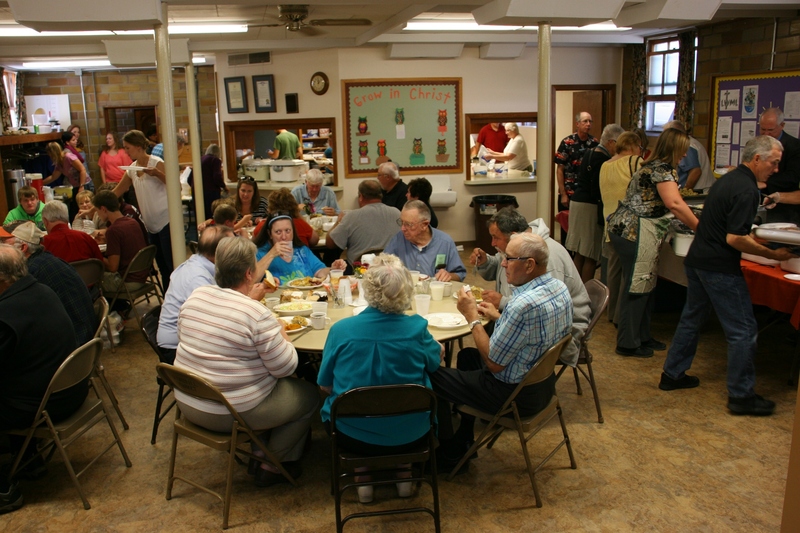 This congregation works together, feeding diners like me who appreciate their efforts and the taste of great homemade food as much as this rural setting and fellowship. 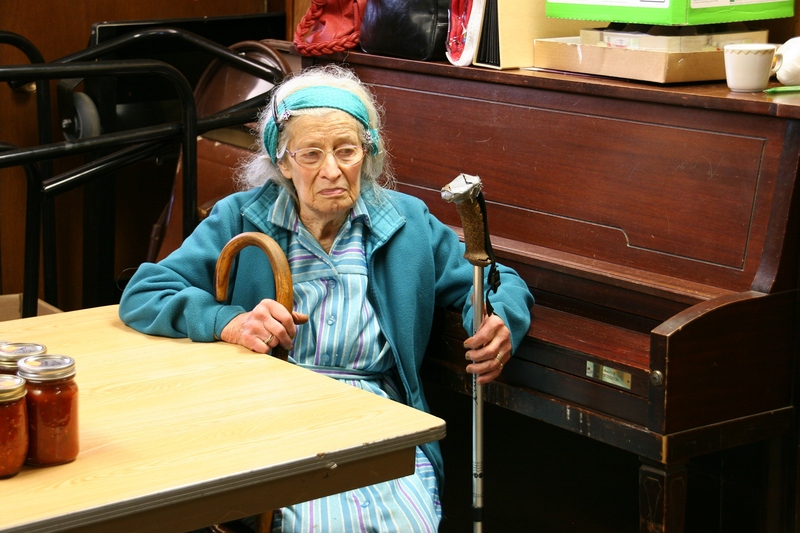 Inside the church kitchen, 88-year-old Elsie works next to her stool. Once I’ve finished my first bowl of potato soup, I get a new bowl and a scoop of bean soup, followed by a second helping of potato. I pass on the third soup; I’m not a fan of either chicken soup or of dumplings. As I finish my dessert, Kim and Keith join my husband and me to rest for a bit and eat lunch. We talk about kids and the horrible long winter and vehicles in ditches and the couple’s continually snow blown driveway and such. It’s a comfortable conversation. 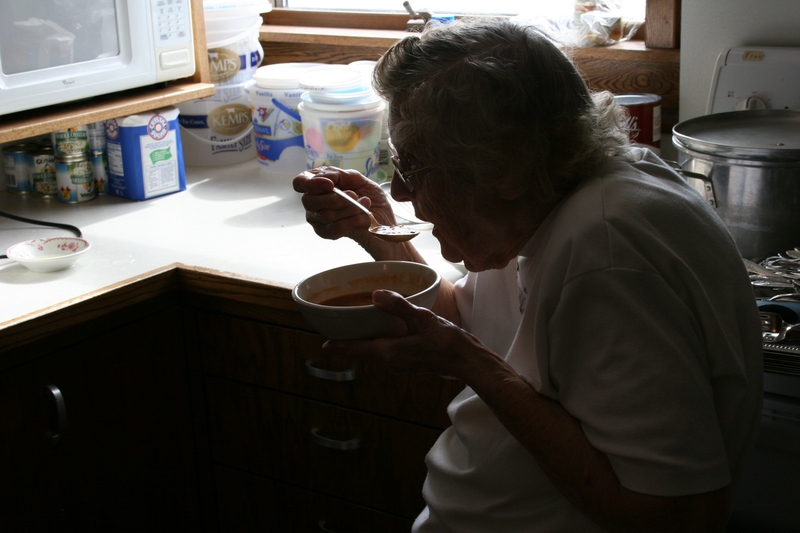 Elsie, 88, sits in the kitchen and enjoys a bowl of bean soup at the end of the luncheon. Before we leave, I pop into the kitchen again and catch Elsie finally sitting down with a bowl of bean soup. 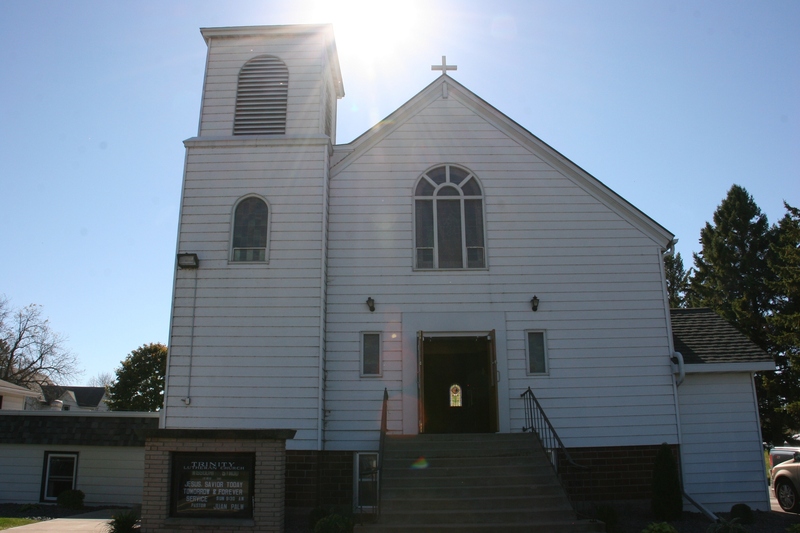 The church is located at 19086 Jacobs Avenue, rural Faribault. These will be your salad options. 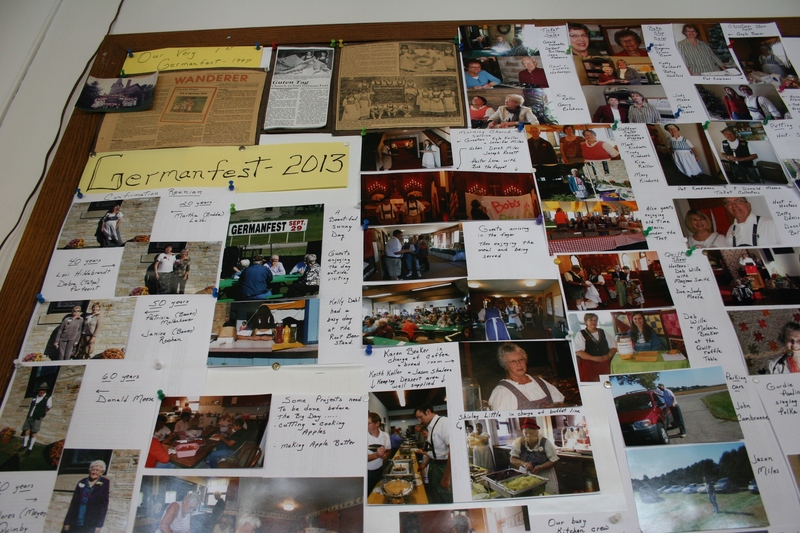 St. John’s UCC Germanfest is another must-attend annual event in September. Great food, entertainment, bingo, quilt show and more define this ethnic gathering. 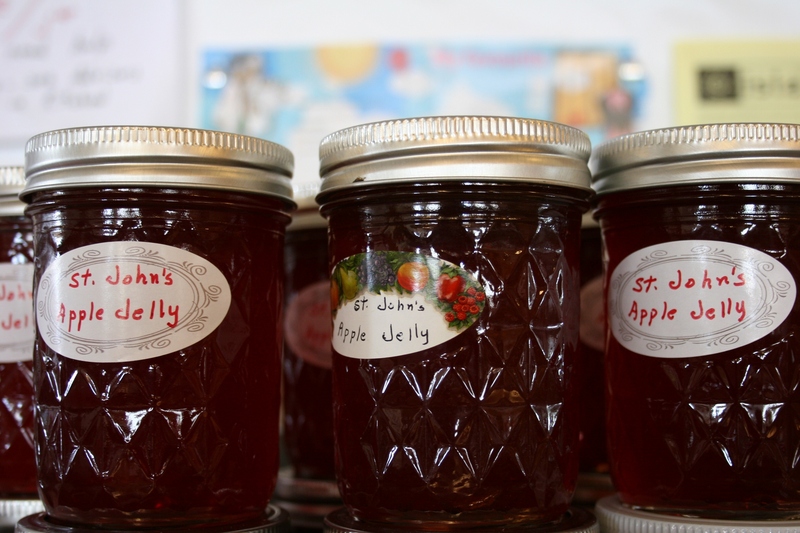 Beautiful and savory St. John’s apple jelly.